Holman’s superior quartz infrared heaters provide faster, more consistent heating than traditional heating elements. Holman’s forced convection system keeps the toaster cool to the touch and extends the life of critical components. The forced convection increases productivity by re-circulating pre-heated air into toasting chamber. Compact – requires only 14-1/2″ of counter space and the forced convection system allows the unit to be placed against a wall. 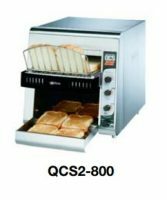 Other toasters have louvers requiring additional counter space. 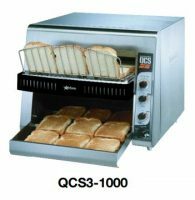 Productivity – QCS2-500 produces up to 350 slices per hour operating on 120V. 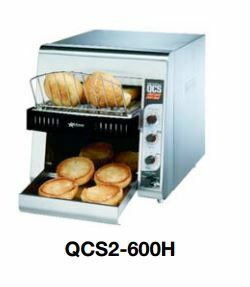 QCS2-800 produces up to 800 slices per hour. QCS2-600H with a 3″ high opening produces up to 600 slices per hour. Easy to use control panel takes the guesswork out of temperature and speed control settings. Variable speed and top/bottom heat control for perfect color and texture of bread, bagels, English muffins and more! Energy efficient operation with power saver switch that reduces electricity consumption by 75%. And our quartz heaters return to full power in seconds vs. minutes for metal-sheathed elements. Extended conveyor belt for easy loading and large warming area for higher production. Safe load up area with full width front burn guard and cool to the touch exterior. “Smart” crumb tray keeps the bread crumbs from falling under the toaster. Heated holding area to keep toast at the perfect temperature. Hi-limit switch prevents toaster from overheating protecting critical component parts. Holman’s forced convection system keeps the toaster cool to the touch and extends the life of critical components. The forced convection increases productivity by circulating pre-heated air into toasting chamber. Quartz infrared heaters provide faster, more consistent heating than traditional heating elements.